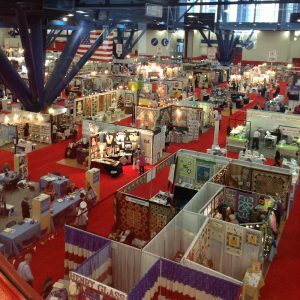 I got home last night after spending 3 days at Quilt Market in Houston, TX (the twice-annual trade show for the quilting/sewing industry). 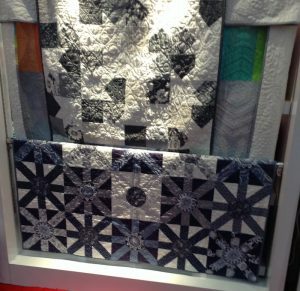 Every six months, I go through a flurry of hectic, last-minute quilting and sewing activity, sewing and quilting for several designers and fabric companies so they’ll have lots of pretty new projects to show off. I’m not the only one who goes through this flurry. Lots of my friends and fellow designers are flurrying right along with me, because there are hundreds, if not thousands, of new things to see at Quilt Market. Every time. Hopefully, all of our hard work entices shop owners to bring home lots of new patterns and fabrics and tools to stock their shops with, so that you can walk into your local quilt shop and get all the goodies as soon as they hit the stores. This is a partial shot of the Market floor. As you can tell, there’s a lot of stuff to see. It involves a lot of walking — there’s a lot of ground to cover in a short time. 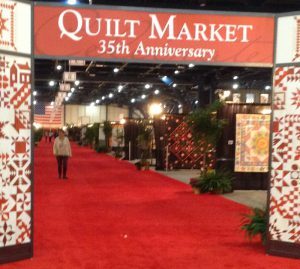 I’ll show you some of the new things that came from this Market, so you can get to your local quilt shop and get yourself some of the goodness. First up, I’m gonna talk about my friend, Victoria, and her new set of cutting dies she has out with Sizzix. You can read posts on the various dies she introduced, and see ways in which to use them, on her blog: bumblebeansinc.blogspot.com. I arrived just in time to take pictures for her of her Schoolhouse session where she talked about the dies and all the ways to use them. I think this is my favorite of the quilts she showed. I just love the happy colors (and I got to quilt this one for her)! 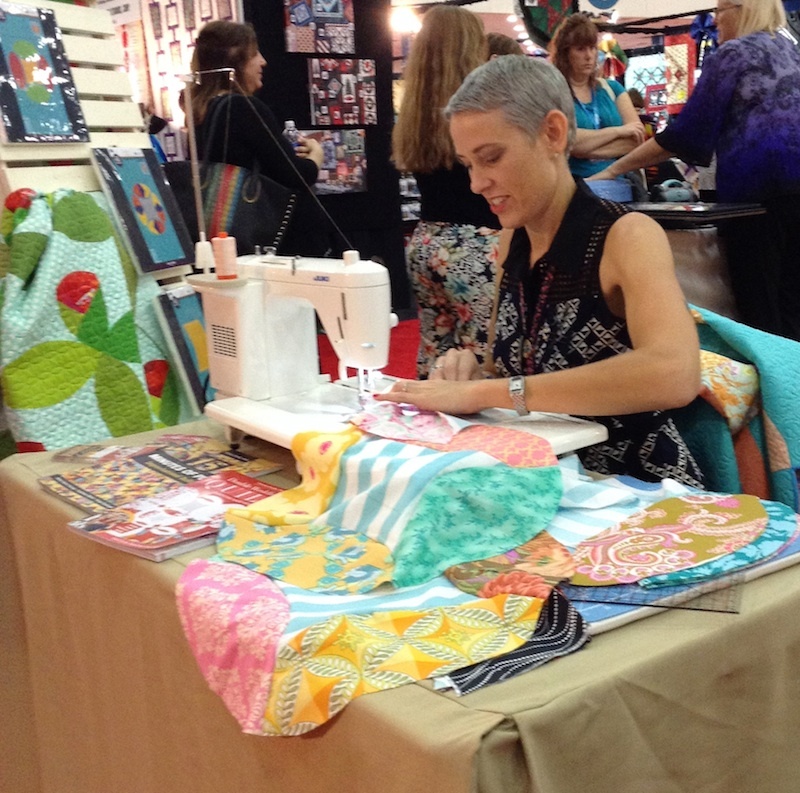 Here she is, in Sizzix‘s booth at Market, demonstrating the dies and making a quilt. 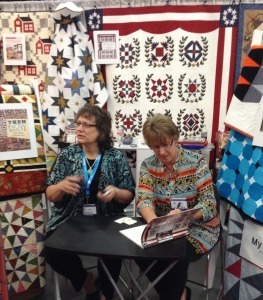 She made an entire quilt top during her demos. 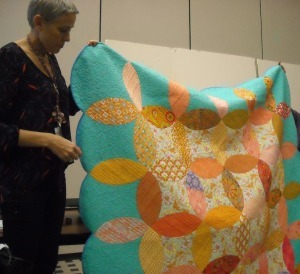 She’s a quilting freak of nature! Jenny Doan, from Missouri Star Quilt Company, also has some new dies out with Sizzix. They go along with some of her patterns in Block Magazine, and with her tutorials. I kinda want the Periwinkle one . . . but the bird is hella cute, too. 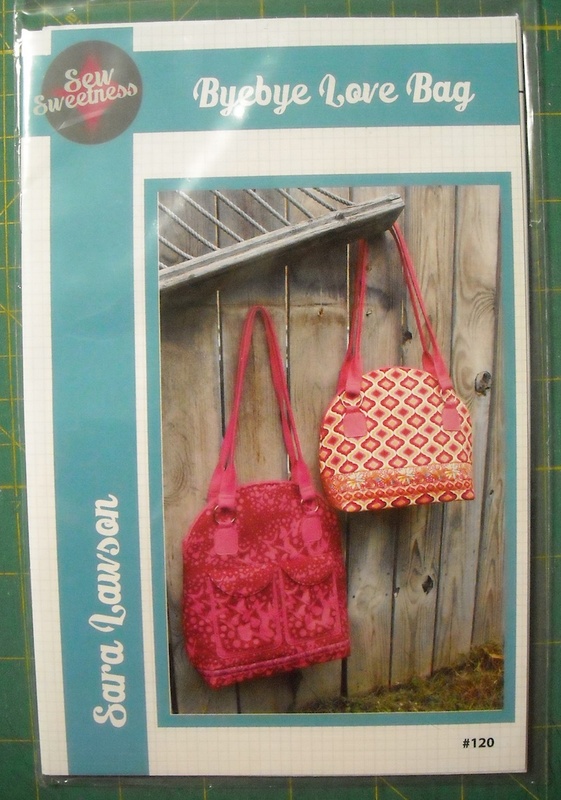 The hot, hot, HOT pattern at Market this year, it seemed to me, was the new Block-of-the-Month by Sassafras Lane Designs, called Arcadia Avenue. Gorgeous, gorgeous quilt. You can see it HERE, and I highly recommend you go look at their pictures. They have it done up in several different colorways, and it’s fabulous in every one of them! 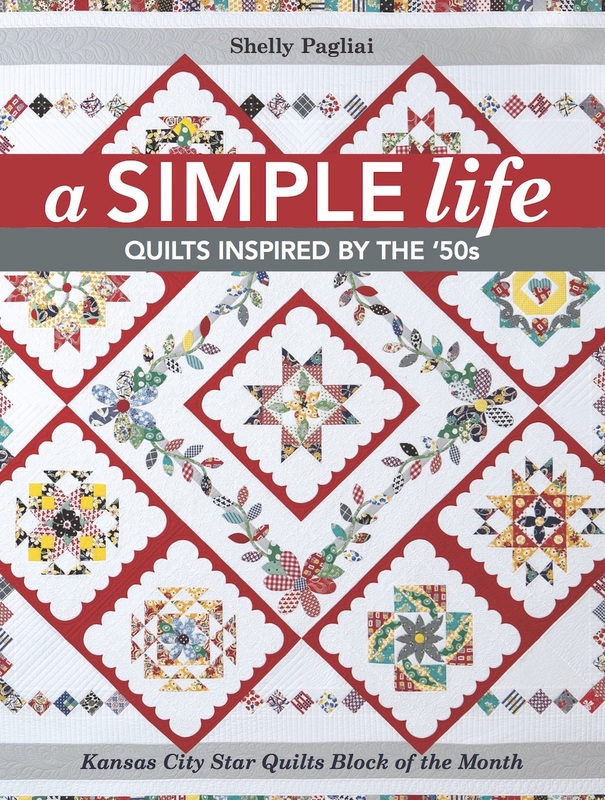 It’s paper pieced, and wonderful — tell your local quilt shop you really want this one! Here’s one of the nicest, sweetest people I know — Pat Sloan. 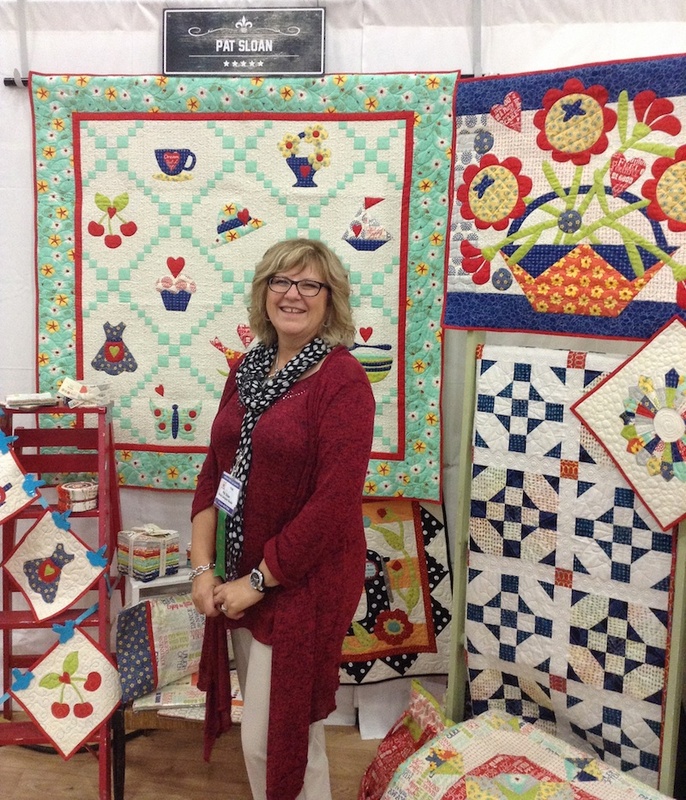 She’s in her booth at Market where she was showing her new fabric line, The Sweet Life, and her coming-soon patterns. The two on the wall behind her — The Sweet Life, and Friends Forever — I quilted for her. You can read more about the patterns HERE, and also see better shots of her new fabrics, out with Moda. 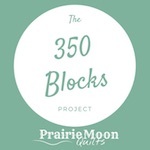 If you’re a fan of the Kansas City Star’s yearly Block-of-the-Month patterns, like my sister and I both are, you’ll be glad to know that this year’s book, containing all the patterns and the bonus projects, has made its debut. My sister and I have been collecting them from the paper, but we both always buy the book, too — how can you pass up the extra stories and the bonus projects? This year, I even got an autographed copy, straight from the hands of the authors themselves, Denniele Bohannon and Janice Britz. 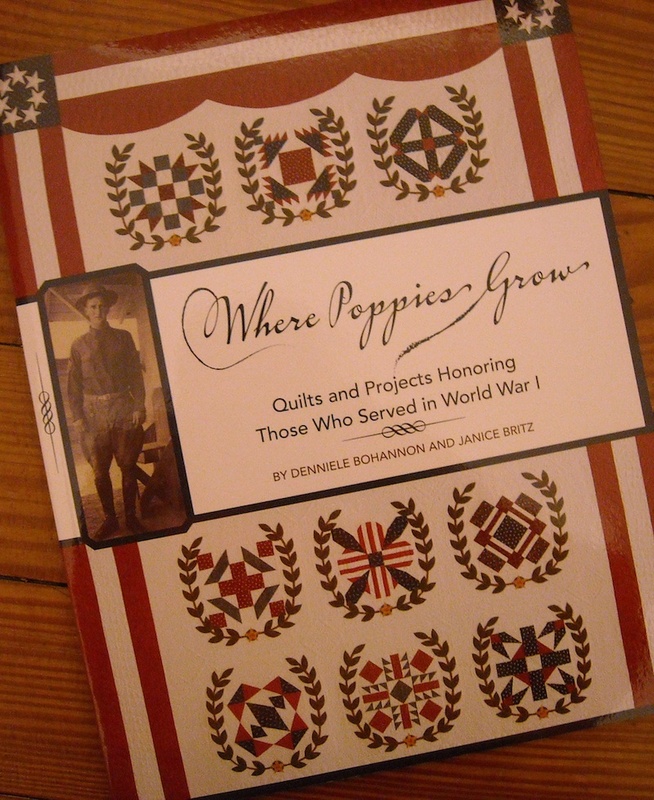 The book is called “Where Poppies Grow: Quilts and Projects Honoring Those Who Served in World War I.” You can purchase your very own copy HERE. 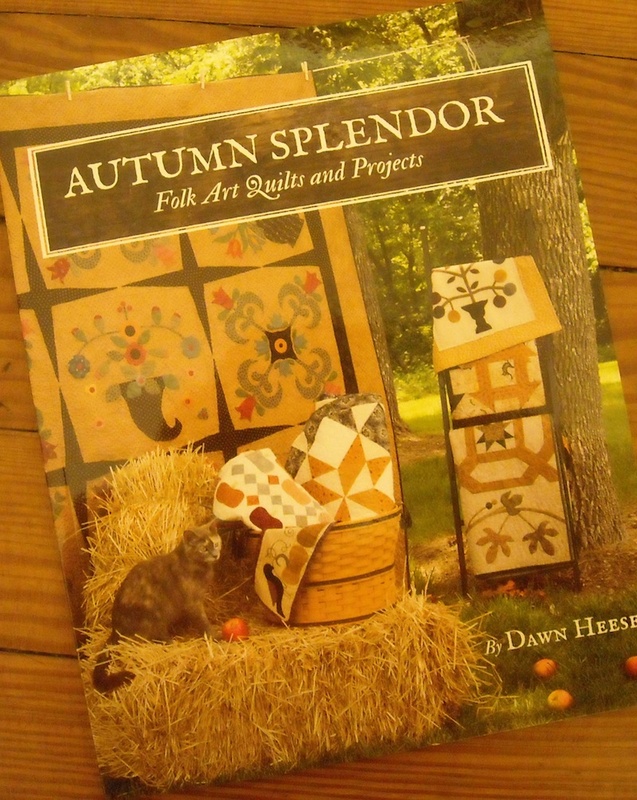 My friend, Dawn Heese, of Linen Closet Designs, also has a new book out, and her booth was just beautiful. I got an autographed copy of “Autumn Splendor”, which you can get HERE. Dawn also has some new individual patterns out, and there’s one in particular I have to have. 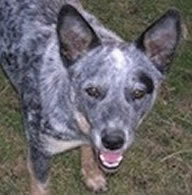 More on that later, once I get my hands on it! 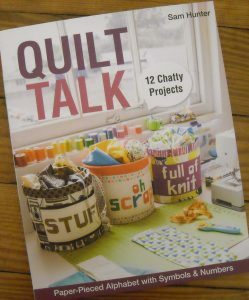 I also snagged an autographed copy of Sam Hunter’s new book, called “Quilt Talk”. 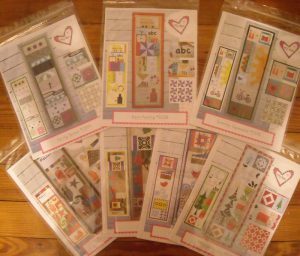 It’s an entire paper-pieced alphabet with extra symbols, and lots of examples for ways to use them in projects. My first project is going to be some of those buckets you see on the cover — so cute! 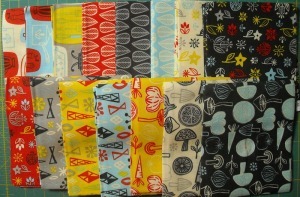 Michelle Jensen, of Mixi Heart, has a whole bunch of new patterns out. The seasonal ones are just darling! 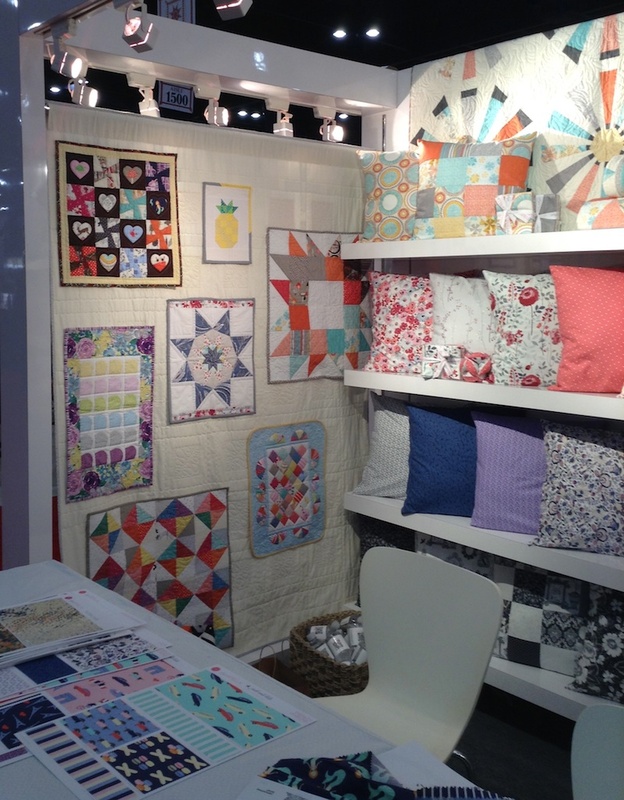 And her booth looked so cute, all done up like a laundry room, which she was quick to tell me looked much neater and cuter than her laundry room at home! (Mine, too, I can assure you!) You can see photos of her cute booth, and read more about all her new patterns on her web site HERE. 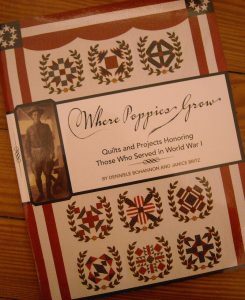 I’ve been talking lately about another new book that’s fresh off the presses, authored by my friend, Michele Muska. 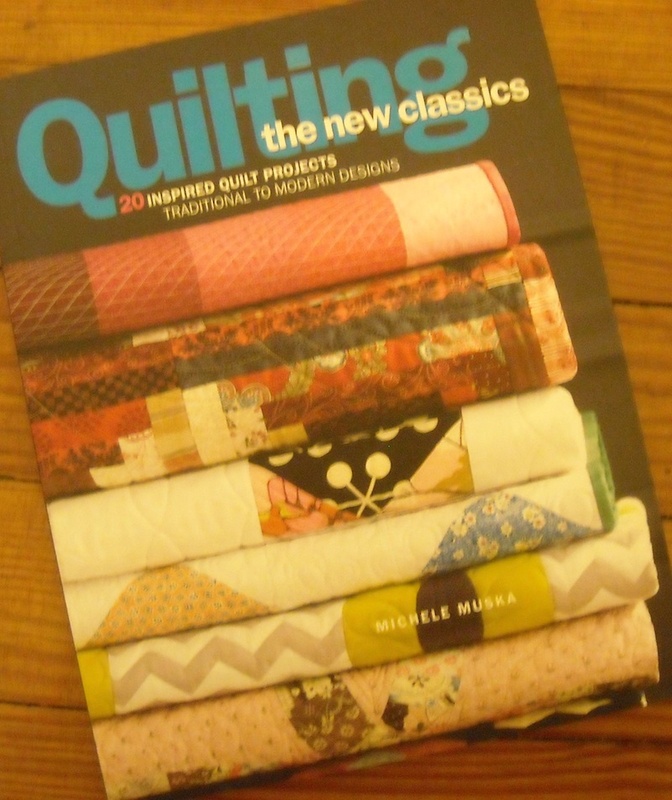 “Quilting the New Classics” is a wonderful book that shows 10 time-honored patterns done in traditional and modern versions. Michele recruited 20 quilters to each make one of the quilts in the book, and I’m honored to tell you that I got to make the traditional version of the Double Wedding Ring Quilt in the book. 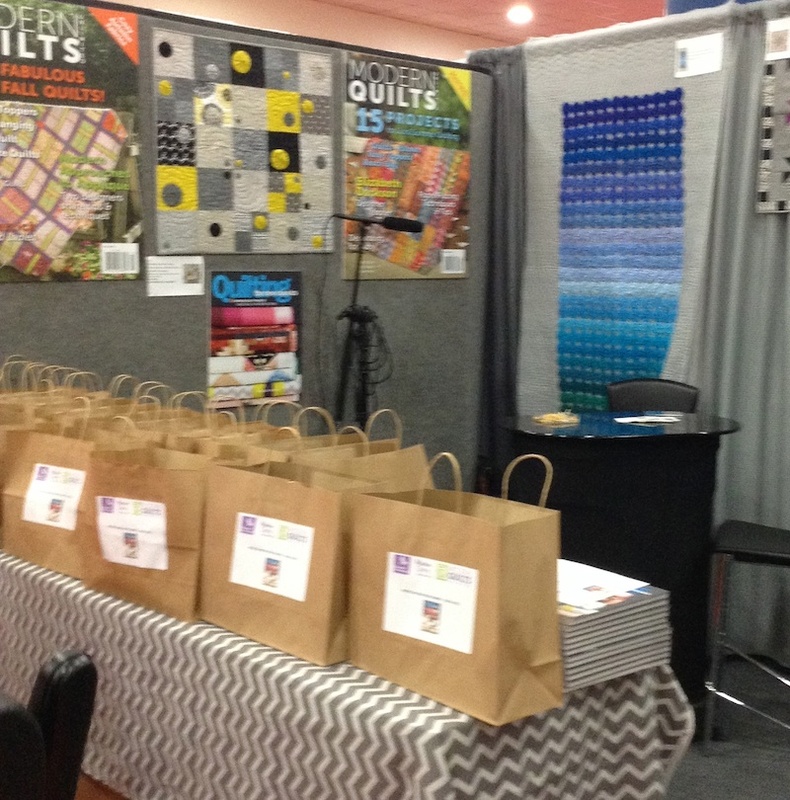 Here’s the Modern Quilts Unlimited booth at Market, all set up for Michele to do her book signing. I’ll be back Friday to tell you more about the book itself, and have a give-away for a copy, too. There’s a blog hop going on right now as well, and you can get lots of chances to win a copy by following along on that. 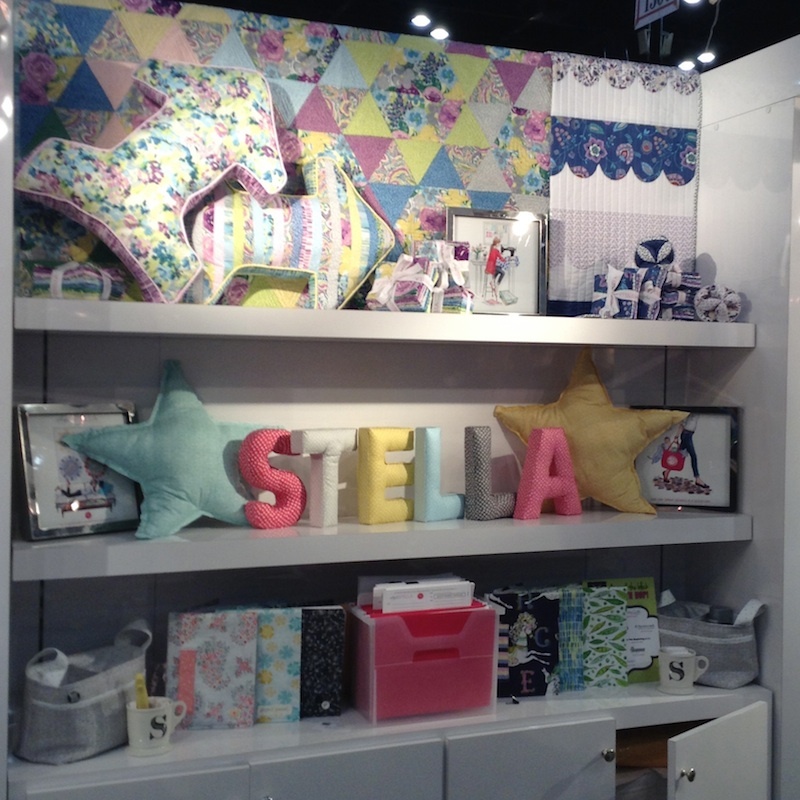 As usual, I sewed several projects for Dear Stella, and they had their booth decorated so lovely. 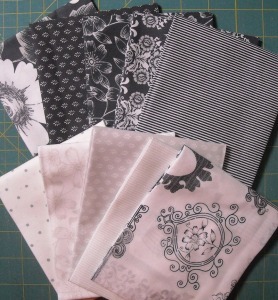 Here are 6 mini quilts that I made for them, using fabrics from all their current collections. The 7th mini quilt in the picture, the little “Patchwork Pineapple” at the top, is a design by Sassafras Lane Designs, and you can get that pattern for free by clicking HERE. And here (at bottom) is the “Sunburst” quilt I made from their Emerson collection. That pattern, by Lynn Goldsworthy, can be gotten for free right HERE. The adorable Sara Lawson of Sew Sweetness was there, with her fabric for Art Gallery Fabrics, and her line of bag patterns. I got this one — the Byebye Love Bag. I’m not a bag maker, but Sara’s patterns really make me want to give it a go! 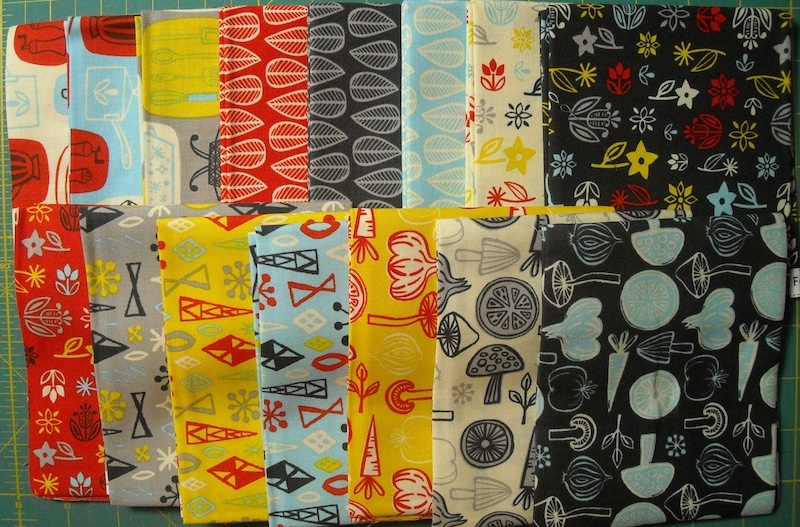 And at Market, there’s always more fabric than you can shake a stick at! I have big plans for both of these. I’ll show you what I make from them later. Quilt Market is not complete without also seeing the quilts. I mean, isn’t quilts what it’s all about? While I did not have time to see them all, I managed to see quite a few, and made a point to see some that are special to me. 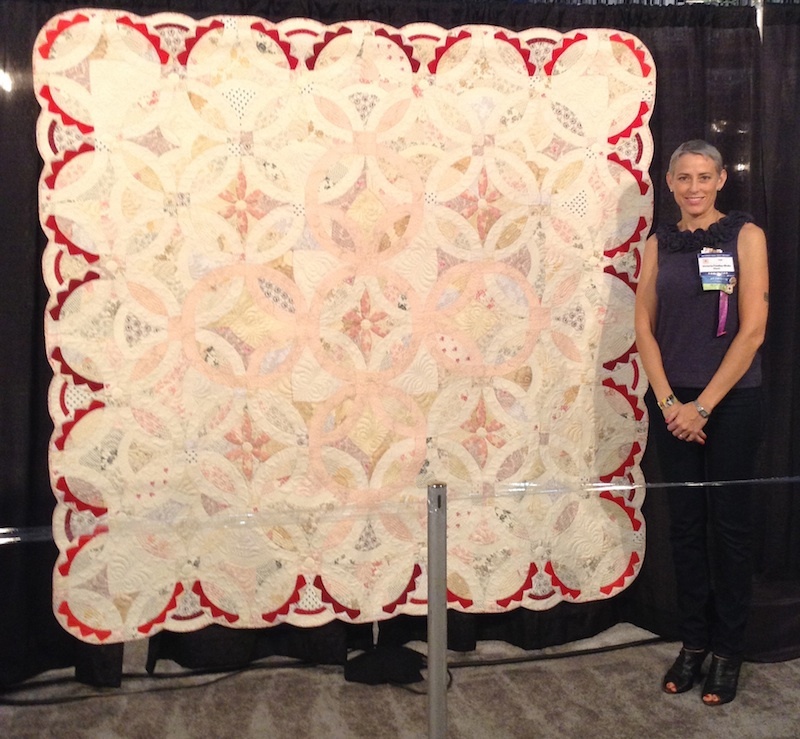 Victoria had her double wedding ring quilt, called “Lace”, juried into the show, and it’s just beautiful. It makes my heart flutter! 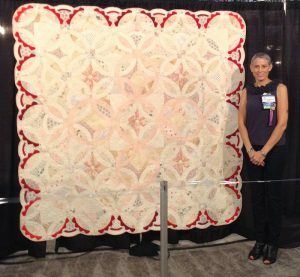 And I had my own quilt, “Passion’s Flowers”, in the “500 Traditional Quilts” exhibit that I told you about earlier HERE. Photos were not allowed in the exhibit, but I shot this one from the Market floor looking into the show hall. It was hanging in an awesome location! 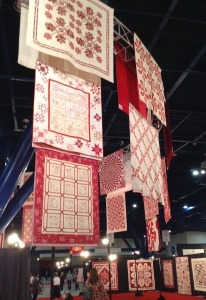 There was also a spectacular exhibit of Red & White quilts, dramatically displayed after the fashion of the Red & White exhibit held in New York some months back. Just look at these! 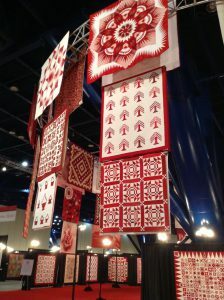 These really make me want to drop everything, and go make a red and white quilt. 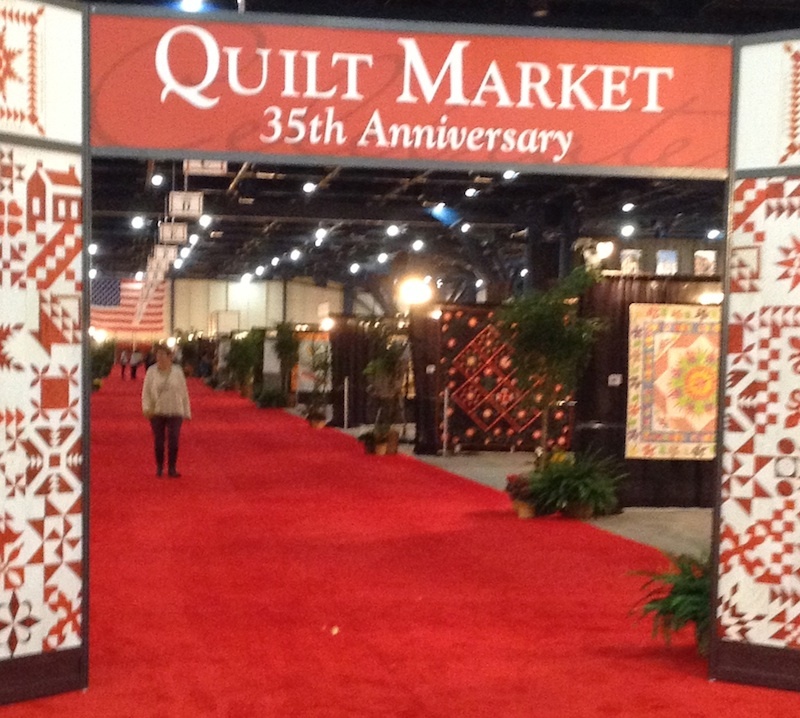 This is the 35th anniversary of Quilt Market, and Quilt Festival begins on Thursday, celebrating its 40th anniversary. This is a landmark year for both events, and I’m thrilled to have been a teeny tiny part of it. I hope you’ve enjoyed the tour! Loved the tour! Thanks for sharing. Thanks for the tour. Looks like you had a great time. 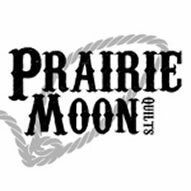 I need to see if the new quilt shop in st. Charles has Pat’s new pattern. Oh, lucky you! 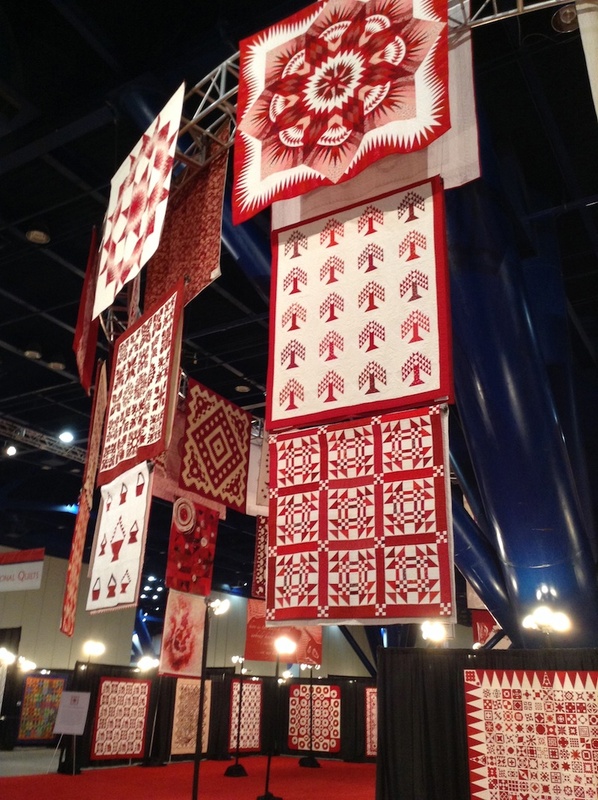 It would have been worth the trip just to see those red and white quilts. Lovely display. Whew! That is a whirlwind of fabric and ideas!! How have you survived!! It’s been a long time since I had a booth at Market, and I was a lot younger then. Reading about all this made me exhausted!